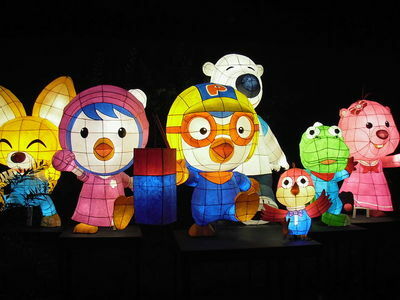 Lanterns in the shape of the characters from Pororo at the Seoul lantern festival 2011. Image from Wikimedia Commons. Some shows have fantastic theme music. Others have a grating, repetitive tune that makes you want to throw your remote control through the television set. Children's shows in particular, can be hard to take if you haven't had your morning cuppa yet, and fellow parents may emphathise with my hatred of Pororo the Little Penguin. Which tv theme annoys you the most? For me it's Pororo, closely followed by Yo Gabba Gabba and Snapatoonies (my son's current favourite). With Pororo it's not just that the music is annoying, the lyrics bother me. It says "with different faces and personalities we are all good friends..." which weirdly caused me to wonder whether Pororo normally only makes friends with people who look and think exactly like him, which is kind of creepy. These are the things that my brain dwells on when I'm tired. Allowing my grandchildren to watch a little kids' TV I am quite familiar with one of the most annoying themes on television. And guess what I gave the youngest for Christmas? A DVD of Timmy the Lamb. I don't think his parents are very impressed. TIIIIIMY! It's Timmy! He's a little lamb with a lot to learn! I've had a long think of this, and I must conclude that the most annoying theme tune is The Tweenies. Kill me now. The little princess song drive me nuts. In fact the whole show is awful. She nags, whines and says I want constantly. It really sticks in my head! For me, the winner is the Block NZ, hands down. The runner up is the new theme for the Block Australia. I love this show, but the theme music horrible and horribly catchy, so it's constantly stuck in my head. The only 1 can can think of right now which I don't like, (as I also don't like the TV show of the same name,) is: Mash.